Oh my golly - it's happened again!!! My quilt Fair and Square won First Place in the modern traditional category at the Australian Modern Quilt Show. And when they announced Best In Show it was My name they called. The Sydney Modern Quilt Guild for putting on an amazing show. The judges, Anna Maria Horner, Carolyn Friedlander and Lisa Cahill. Anna Maria Horner and Carolyn Friedlander for coming to Australia, teaching workshops and spending time at the show. They both added such a special magic to the weekend. especially Bernina Australia who supplied the Best in Show prize of a fabulous sewing machine. and Material Obsession for their super duper pack of fabric and awesome sewing goodies that was the prize for First Place in Modern Traditional. All my friends, family and lovely people who have congratulated me and complimented my quilt. Last but not least Mr Daisy who is my biggest fan. Oh! Congratulations on your win! It truly is a beautiful quilt and well deserving of it's (your) win!!! Woohoo and Yippee!!!!! Congratulations! This is so awesome! Well done! Congratulations on another super win! Lovely happy photo in front of your happy and vibrant quilt. Congratulations again Rachael! So well deserving! Your quilts are graphic, unique and fun! What will you do with another sewing machine?!!! Become a Bernina ambassador! What a lucky creative lady you are and so deserving. Huge congratulations! Wish I could have been there to see this beauty. Lots and lots of congratulations!!! You have a another wonderful quilt there, it's beautiful. you star...another spectacular quilt. Huge congratulations. You are looking great. Oh! and so is Fair and Square. Hope you've got a pool room to take all your well deserved ribbons to. Seriously Congratulations and a big virtual hug. 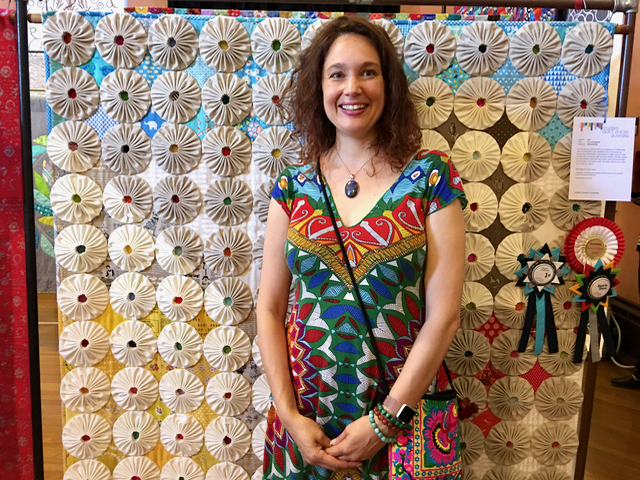 Congratulations Rachael, and such a lovely quilt,so deserved. Congratulations! This is such a clever quilt - the more I look at it the more I find. Wow ... That's such great news ! You're very creative and your quilts are so original. Congratulations Rachael ! Woo hoo! Congratulations - I can see why it has won first place; it's spectacular! I think you should record a short video tutorial on how you make such beautifully neat yoyos (and two tone ones to boot!). Love your dress! Bravo Rachael! You have made yoyos modern, it was such a challenge ! What a brillant idea to make them with 2 fabrics, and oversized, and, and... You are a great and lovely quilter! What a wonderful honor ! Congratulations Rachael ! Not only is your quilt awesome...that is a very cute dress ! 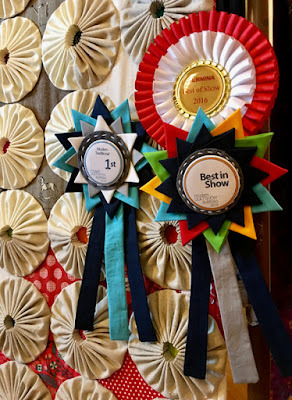 Congratulations on best of show for wonderful quilt. It is a great design, and what a beautiful lady standing in front of it. I'm so happy for you!!! Well-deserved! Another winner, congratulations! An amazing quilt, those giant yoyos must have taken quite a bit of time to make? I'm so very pleased for you Rachael! Your work is full of creativity and colour, using old techniques in fresh new ways. It must have been wonderful having Anna Maria Horner and Carolyn Friedlander there too! Did I see photos of you enjoying one of AMH's workshops too? A very special time indeed and I love that Mr Daisy is your biggest fan! That's awesome, you will be able to open a public sewing studio with all those machines soon! Congratulations on an award that's well deserved!! You are really having an amazing year!!! It seems that barely a month goes by without something exciting happening. So, with only December left, what next? BRAVO ! Your quilts are always so original. Huge Well Deserved Congratulations Rachael....so excited and happy for you! It couldn't happen to a nicer quilter! Congratulations! I love it! Oh my...I'm late ! Congrats ! Congrats ! Congrats ! It's Christmas before Christmas ! Wow, you must have been so thrilled! Well done, and it's a lovely quilt. congratulations again Rachael!! You really are a superstar quilter now!! Looking forward to seeing more photos but absolutely love that photo of you looking so delighted! How very exciting Rachael! All those years of work and now the well-deserved rewards are piling up. Congratulations!!! Amazing no surprise that you are the winner!! Been catching up with your blog and have had a lovely evening and a cuppa! Luv all that u do! !